Inset: Dr. Pieter Koen from the State Veterinary Services in South Africa draws blood from a white shark in South Aftrica.Background: Great white shark, South Africa Credit: Inset: OCEARCHBackground: Neil Hammerschlag, Ph.D. Researchers found high concentrations of mercury, arsenic, and lead, in blood samples obtained from Great white sharks in South Africa. The samples had levels that would be considered toxic to many animals. However, the study found no apparent negative consequences of these heavy metals on several health parameters measured in the sharks, including body condition, total leukocytes, and granulocyte to lymphocyte ratios, suggesting no adverse effects on their immune system. "The results suggest that sharks may have an inherent physiological protective mechanism that mitigates the harmful effects of heavy metal exposure," said Liza Merly, study lead author and senior lecturer at the University of Miami (UM) Rosenstiel School of Marine and Atmospheric Science. "As top predators, sharks bio-accumulate toxins in their tissues via the food web from the prey they eat," said Neil Hammerschlag, study co-author and research associate professor at UM's Rosenstiel School and Abess Center for Ecosystem Science & Policy. "So by measuring concentrations of toxins, such as mercury and arsenic, in the blood of white sharks, they can act as 'ecosystem indicators' for the health of the ecosystem, with implications for humans," he said. "Basically, if the sharks have high levels of toxins in their tissues, it is likely that species they eat below them will also have toxins, including fishes that humans eat." For the study, 43 great white sharks were captured and sampled in South Africa, as part of Ocearch's 2012 expedition to the area. 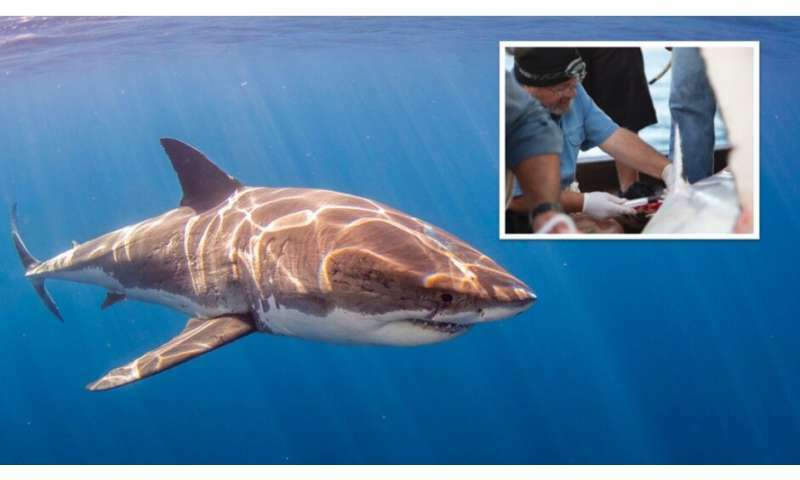 "To collect the samples, white sharks were carefully raised on a specialized platform, while blood samples and body measurements were taken by biologists before the sharks were tagged and released," said Chris Fischer, expedition leader and founding chairman of Ocearch. The shark's blood was screened for concentrations of 12 trace elements and 14 heavy metals. This study provides the first published account of blood concentrations of heavy metals in wild sharks. The data is instrumental in creating a baseline and reference for levels of heavy metals present in the blood of white sharks in South Africa. Considering many populations of large sharks are experiencing declines across the globe, it is important to understand the impact of toxic metals, if any, in this population. The possibility that white sharks could have a physiological mechanism that protects them from the harmful effects of metal exposure offers new opportunities for future shark research. The study is titled "Blood plasma levels of heavy metals and trace elements in white sharks (Carcharodon carcharias) and potential health consequences", was published in the Marine Pollution Bulletin on March 19 2019.